Where do missing things and people go? That is the question for Sandy Shortt. She’s has a obsessive compulsive thing that she doesn’t stop looking for the things that she lost. For example, a sock. She lost a sock and she spend a lot amount of time to look for it in every corner of their house. Good thing her parents are very understanding and supportive of her condition. When did this condition of her started? That’s when her neighbor frenemy Jenny-May Butler gone missing. After that incident, she can’t be settled if she can’t find what she’s looking for. And this habit has somehow led her to going the Garda. But then she wasn’t satisfied there so she left her job and started her own agency for missing persons. She’s been searching for people, for things all her life. And this time, she’s the one has gone missing. And where does she go? To a place called ‘Here’. ‘Here’ is the place where the missing persons and things go. Sandy finds it a hard time absorbing everything. Then she sees those people that she has been looking for a long long time. Even the things that she’s been looking for. But what do you do when you finally find what you’re looking for? This book for me is 3/5. It’s a good book. It has a nice story. I just found it a hard time to wrap my head around the place called ‘Here’. It’s a mix of reality and fantasy, so it was a bit slow for me to cope up with the setting. I was thinking at first if she was just dreaming or hallucinating or something. But the end part was really touching and it got me teary eyed for a second there. And at the end, no matter how lost things and people get, they always find their way back. 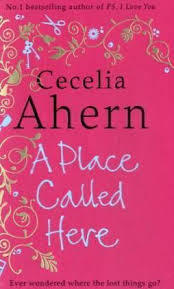 This entry was posted in Uncategorized and tagged A place called here, Book, book review, cecelia ahern, There's no place like here by Cat. Bookmark the permalink.